I am loving La Gazzetta dello Sport's latest campaign, the above seen in the Milano Centrale train station. Italy is the only nation in the world to have a daily newspaper dedicated solely to sport... and they don't have just one, they have two (the other being the Corriere dello Sport). Not only that, in a day and age where newspaper readership is continually declining, La Gazzetta still claims a readership of over 3 million. Printed on pink paper, La Gazzetta dello Sport really does show us that "La vita ha un altro colore / Life has an other color" with some cool guerrilla marketing earlier this month in Roma and Milano. 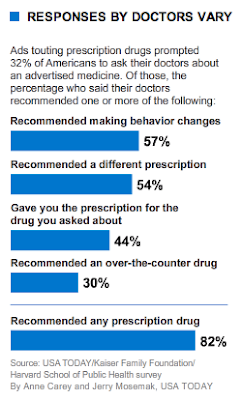 USA Today says: "Prescription-drug ads prompt nearly one-third of Americans to ask their doctors about an advertised medicine, and 82% of those who ask say their physicians recommended a prescription." Now, these numbers are a little skewed (see graphic) but please stop going to your doctor and demanding the prescription you need because you saw it advertised. Please stop self-diagnosing yourself based on a 30-second advertisement with writing in the bottom of the screen so small that the pixels blur. There's a reason why those doctors went to all those years of school and why you pay them so damn much. They're the experts and will prescribe or not prescribe the drug you need or don't need. I wouldn't say this often but there should be more restrictions on this type of advertising and a more adequate approval process in place. Drug companies can basically pump out their (sometimes deceiving) ads and air them before they've even been reviewed by the FDA. Thus, ignorant Americans want these drugs like they're the next Talking Elmo, PlayStation 3 or Beenie Baby. Do people in America really have half the problems that they think they have? Am I turning into Tom Cruise? Hey guys, mental retardation is a hoax! No... I just wish people weren't so f'ing gullible and stupid. And I'm not just talking about the world of advertising anymore. Basta. Back in November I asked how many people actually paid for Saul William's album when given the choice to download it from his website for $5 or free. Now Trent Reznor, Saul's collaborator, has revealed that approximately 80% of didn't pay. I was one of them. And he was "disheartened" by this. Saul on the other hand is quite content with the results, understanding that it was an experiment of sorts and that this innovative method actually liberated him from dealing with record labels and allowed him to keep any profits made. He also states, "You're dealing with myself, an artist not everyone has heard of and not everyone is going to necessarily try if they have to pay for it." He then tells us most of artists' revenues come from touring anyways. Exactly. I am in that camp. I didn't want to pay for something that I had no idea what it was other than Trent Reznor telling me he liked it. And now, given the opportunity, I would go see Saul Williams perform. As Saul says, his album is now on my iPod and when the album was first released, I sent the link to lots of friends. And that was the most important thing... just getting that initial exposure and generating some buzz. Now Reznor is again modifying and expanding his technique with the new Nine Inch Nails album. After dumping his label, he has released Ghosts I-IV on the web, even uploading Ghosts I to BitTorrent himself and encouraging others to share it for free. The first one's free and you are encouraged to buy Ghosts II-IV for $5. But even the free version comes with extras like a 40-page PDF, backgrounds and web graphics so you too can shamelessly post it to you blog this and do his advertising for free. Now come the important questions. This model may work for established groups like NIN and Radiohead... and it is innovative to give a little something away for free. How do you think they talk you into buying the whole Hickory Farms gift basket? First they let you try the summer sausage. But does this really change anything? Will those who download for free be encouraged to pay $5 to get it from the artists' website? I think this is great for smaller acts... anything to take control and money away from the record label and put it in their own hands. But Saul Williams is still a very unique case. Not all groups have the help, friendship and expertise of Trent Reznor on their side. All in all, this is a move in the right direction... let's see where it takes us. Let me preface this post: I watched the Superbowl in Germany so there was no American advertising... but I can't say that I missed much. Maybe this is a little dated but I just watched the Superbowl ads on MySpace, which I think was an innovative way to feature America's most costly advertising. I'm interested to know how this works. Does MySpace pay advertisers to feature these ads on their site or was this part of the contract signed when buying Superbowl airtime? Either way it favors everyone involved, especially advertisers because MySpace users can even post the ads to their profiles. On to the ads. This FedEx spot was the only one I thought was worth a damn, and of course, the Tide Stain ad is an old favorite. Several others from Gatorade, Bridgestone and T-Mobile were okay... but nothing new and boring upon repeat views. And the only one that made me laugh was the E*Trade baby and clown. Now onto the bad ones... Anheuser-Bush whether trying to be funny with Bud Light or serious with the traditional Budweiser Clydesdale's. The Claritin Nascar spot in the 3rd quarter was just bad. Never start an ad with: "Even if you don't drive 180 m.p.h. like I do...."
And the absolutely terrible: SalesGenie.com. These ads are normally horrible but this time around they seemed borderline racist and offensive to me... the pandas (named Ching Ching and Ling Ling) with Chinese accents and the Indian immigrant (named Ramesh) who has seven children to feed. But the one that takes the cake, and even managed to make its way into the international broadcast, is GoDaddy... what's even worse about these always awful ads is the stuff that doesn't air on TV but is hosted on their site. You've been warned. See if you can find Ocho Cinco's spot... do you really think Chad Johnson updates his own webpage? Use their handy rating feature to tell them how much you love their stuff (it's created in-house). Last but not least on the note of bad ads, what was with commercials featuring popular dance moves from 10+ years ago? Diet Pepsi Max thought that it was about time to dig up Haddaway's "What Is Love?" and ride on Will Ferrell's coattails but without actually paying him to appear in the spot... maybe because Bud Light already claimed him for one of their SIX spots. And really, who was the genius who thought CG lizards doing MJ's "Thriller" dance were gonna sell Sobe Life Water? I would of been more interested (much more interested) in a contest to win Neverland before it goes to the auction block. Even after Coca-Cola's 10-year hiatus from advertising during the Superbowl, their ads left something more to be desired. Disappointing ads from the Superbowl again... it seems like this happens every year.